Within a couple years of coming into this world, my life was turned upside down by viruses. From being hospitalized with Chicken Pox, Croup and the Hong Kong Flu of 1968, I was hit hard very early in life. Growing up, I dealt with multiple health issues that were always attributed to a virus. 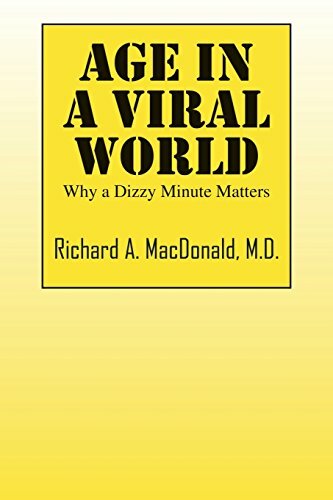 I found this very frustrating because I felt like everything unknown was lumped into a “virus.” After reading, “Age In a Viral World,” written by a medical doctor with an impressive background, Richard A. MacDonald, MD, I realized that maybe my doctors were actually correct. Dr. MacDonald gives a concise discussion on how viruses are virtually everywhere, including in the air we breathe. As we take them into our system, they create a multitude of problems that are typically associated with other health issues, especially for those that are aging. For the aged, these conditions are usually related to the brain, heart, and the gut. MacDonald believes that many health problems are misdiagnosed and are actually caused by viruses. Using his own body as a subject, he shares health issues that he experienced and how he saw over forty doctors to try to find out what was wrong. The diagnoses were usually all over the place. As he did further research, he realized that viruses could be the culprit for many health conditions because they can cause a gene to mutate.